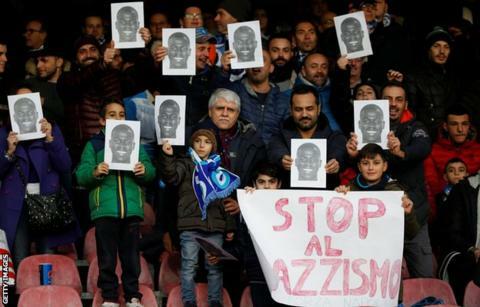 Napoli supporters held aloft posters and banners in support of defender Kalidou Koulibaly in their first match since he was allegedly racially abused. Senegal international Koulibaly missed the 3-2 victory over Bologna as a result of the red card he was shown during Thursday's game at Inter Milan. Fans at the San Paolo carried posters which read 'Siamo tutti Koulibaly' - 'We are all Koulibaly'. Inter supporters, meanwhile, were barred from Saturday's match at Empoli. After a meeting between the club and its security group, Empoli announced ticket sales to away fans had been "suspended" and further information would be given to those who had already purchased one. Inter won the match 1-0, with Koulibaly's Senegal team-mate Keita Balde scoring the winning goal in the second half. Luciano Spalletti's Inter must play their next two home games at the San Siro behind closed doors. In Naples, Dries Mertens scored a late winner and Arkadiusz Milik netted twice for Carlo Ancelotti's side to stay nine points behind unbeaten leaders Juventus, who beat Sampdoria 2-1. "It doesn't matter the colour of the skin. "And in freedom we are all alike. "Tomorrow we will all be Koulibaly!" Match ends, Napoli 3, Bologna 2. Second Half ends, Napoli 3, Bologna 2. Attempt missed. Rodrigo Palacio (Bologna) right footed shot from the centre of the box is high and wide to the right following a set piece situation. Offside, Napoli. Kevin Malcuit tries a through ball, but Fabián Ruiz is caught offside. Corner, Bologna. Conceded by Alex Meret. Attempt saved. Danilo (Bologna) header from the left side of the six yard box is saved in the bottom left corner. Assisted by Riccardo Orsolini with a cross. Corner, Bologna. Conceded by Nikola Maksimovic. Attempt saved. Fabián Ruiz (Napoli) right footed shot from the centre of the box is saved in the centre of the goal. Assisted by Adam Ounas. Corner, Bologna. Conceded by Kevin Malcuit. Goal! Napoli 3, Bologna 2. Dries Mertens (Napoli) right footed shot from outside the box to the bottom left corner. Assisted by Fabián Ruiz. Attempt blocked. Mário Rui (Napoli) left footed shot from outside the box is blocked. Assisted by Fabián Ruiz. Goal! Napoli 2, Bologna 2. Danilo (Bologna) header from the centre of the box to the high centre of the goal. Assisted by Erick Pulgar with a cross following a set piece situation. Substitution, Bologna. Riccardo Orsolini replaces Andrea Poli. Offside, Napoli. Arkadiusz Milik tries a through ball, but Dries Mertens is caught offside. Corner, Napoli. Conceded by Filip Helander. Attempt blocked. Dries Mertens (Napoli) right footed shot from the centre of the box is blocked. Assisted by Arkadiusz Milik. Substitution, Bologna. Ádám Nagy replaces Mattias Svanberg. Attempt saved. Arkadiusz Milik (Napoli) left footed shot from the left side of the box is saved in the bottom left corner. Assisted by Fabián Ruiz. Allan (Napoli) wins a free kick in the attacking half. Attempt missed. José Callejón (Napoli) right footed shot from outside the box is too high. Assisted by Dries Mertens. Foul by Faouzi Ghoulam (Napoli).